As Elizabeth Warren’s presidential campaign gets off the ground, President Trump is coming after his potential 2020 rival with a meme. 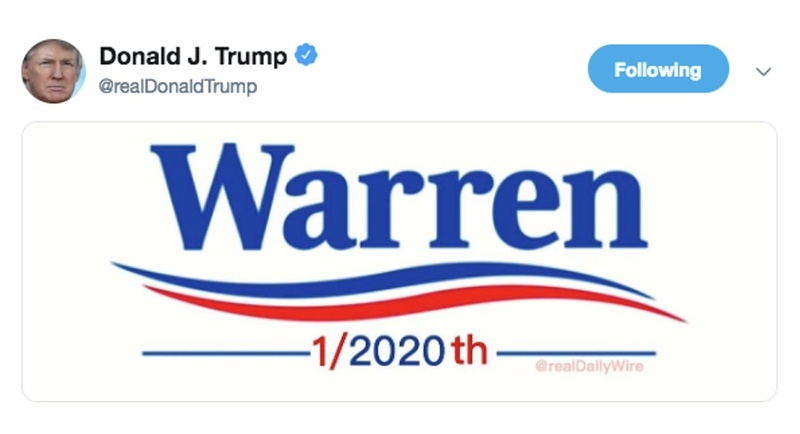 In a tweet on Thursday morning, the president tweeted an image showing a mock-up of a “Warren 2020” campaign logo, except the 2020 has been altered to read “1/2020th” instead. It appears to be a mocking reference to results from a test Warren took in October that showed she had a Native American relative 6-10 generations removed—meaning she herself had between 1/64 and 1/1,024 Native American genes. So now that Warren has announced the beginnings of a run for the nomination, and as a government shutdown nears the two-week mark, the president is doing DNA memes. It was the second time he’s done so this week: A poster print-out of a Game of Thrones-themed meme, starring Trump, could be seen on a table in front of the president during a cabinet meeting yesterday, for reasons that were not really clear. The 1/2020th image appears to be the brainchild of the Daily Wire, a conservative website run by commentator Ben Shapiro, which tweeted a similar version on New Year’s Eve. A watermark of the site’s Twitter handle appears in the version Trump shared from his account, and the site confirmed the meme’s origins with a series of way-too-excited tweets and links to buy the meme in T-shirt form.